Here is an example of an interesting night sky scene, but one that doesn't quite make the final astronomy portfolio. It is a patch of sky just off of the bright star Rigel of the constellation Orion. 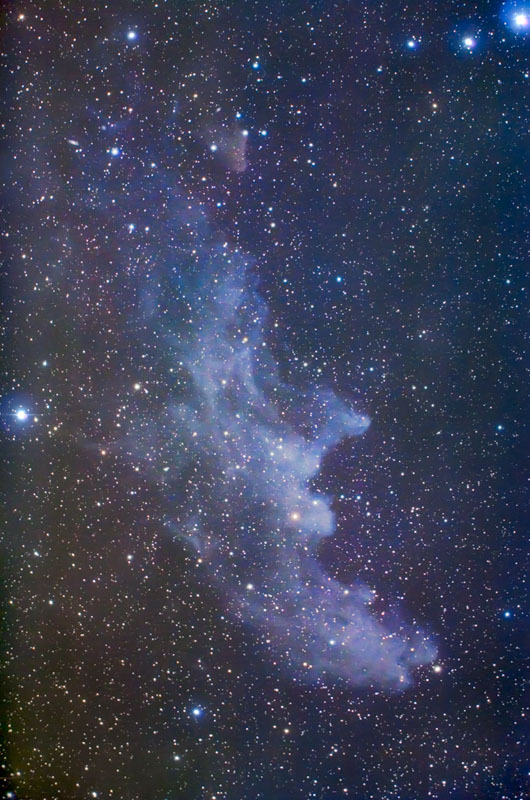 The nebula is referred to commonly as the Witch Head Nebula for obvious reasons and can be found by searching for IC 2118 in astronomical data banks. The nebula is remnance of dust and gas from a prior supernova in the area. The object itself is in the constellation Eridanus. The image is fine to look at, but does not make the final cut for portfolio print quality. The data simply isn't strong enough for print and the composition isn't quite strong enough. This will be one of my targets for the upcoming Winter Star Party in the Florida Keys in February. The Takahashi FSQ 85 with reducer should provide just the right composition, although I may have to go to a 200mm lens as well. Just another example of the many hours that go into images that you may or may not see in final print and on the portfoio pages. Thank goodness that blogs at least give some of these images a home. Take care. Technical details: The image was captured during the Winter Star Party 2009 in the Florida Keys. Telescope was a TMB 92SS with Televue focal reducer/flattener in place. The camera was a modified Canon 450D. 30 images of 4 minutes duration were stacked in Images Plus after RAW conversion in Adobe Light Room 2.5. All enhancements were made within Adobe Photoshop CS4.